The GolfBuddy Tour will boost your golfing confidence by letting you know the distance to where you need to go next, and this will also give you better scores. It is also pretty straightforward and easy to use and has a long battery life. Besides from the few shortcomings (are quite minor issues, and you can easily overcome them) this device will add a lot of value to your game. For any golfer that wants a best Golf GPS that is easy to use the GolfBuddy Tour is a good buy. 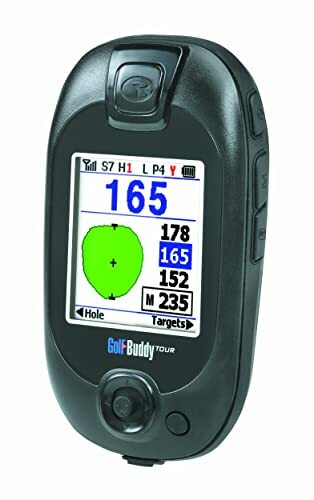 The first impression that I got when I first saw the GolfBuddy Tour GPS is that it was just one of those average devices. This is because it is very similar in appearance to standard Golf GPS devices. However, when I got to use it, I realized it was way much different, and it had an edge over the other devices. Although most of its features are the standard GPS features what gives it an edge is that everything works as it should and hence making it easy to use, convenient and very accurate. Using this golf GPS is also very comfortable as it is light and the design is also quite appealing. I have been using it for a couple of weeks now, and it feels weird for me to go out to the course without it, and so it’s always in my pocket. Shot Tracking: It’s possible for users to measure the distance to their shot, but there is no option to save the club used or more than one distance at a go. Auto-Advance: Golf Buddy automatically advances to the next hole and hence making it simpler and convenient to use. Scores and Statistics: This GPS allows you to enter scores, and it will keep track of your progress making it possible for you to get statistics on your game. Custom Mapping: You can add up to eleven marked points per hole when playing with the custom mapping feature. Pre-loaded Courses: GolfBuddy comes with 24,000 courses from across the world which is one of the highest numbers found in GPS devices currently available on the market. Buttons: The manufacturer keeps things simple with a few basic buttons for Power, Menu, Mark, Cancel and a five-way navigation joystick. Display Screen: It has a color screen with clear numbers and text and also allows you to adjust the contrast. Views: The device provides “target view” and “green view”. Power: Uses a Lithium battery that can last up to 12 hours and it also has triple A battery for backup. The GolfBuddy Tour utilizes the latest GPS technology to provide the golfer with a simple device that will take their golfing experience to a new level. By using this GPS, golfers can be assured of several benefits key among them being the ability to track score and get statistics on their progress when playing. Apart from this golfers will also benefit from a multi-lingual feature that makes it possible to use the GPS in a language that you understand or are most comfortable with. Easy to set up as all you need to do is turn it on and you are good to go. It gives you the ability to add targets when playing and this is vital for your game. There are no course download or membership fees, and so you will only pay the buying price and nothing else. It is multi-lingual meaning that you can use it in the language you are comfortable with. Although it has many features, they are not as many as in other devices in the same price range. Some users have complained of mapping inaccuracies when using the device. The user manual that comes with the device is not very detailed, and so it might not be very useful for newbies. The GolfBuddy Tour will boost your golfing confidence by letting you know the distance to where you need to go next, and this will also give you better scores. It is also pretty straightforward and easy to use and has a long battery life. Besides from the few shortcomings (are quite minor issues, and you can easily overcome them) this device will add a lot of value to your game. For any golfer that wants the best Golf GPS that is easy to use the GolfBuddy Tour is a good buy.